Description This aryballos is in the shape of an African head. It has a hemispherical mouth with a straight support, rectangular in section on either side. The mouth is glazed black outside and inside and is painted with red over black on top of the rim. The supports are painted black on three sides and red over black on the outside. The body is painted black. The back of the head is smooth, the lips are red, the irises of the eyes are white, the interior of the ears are white and red. Added clay dots for the hair are painted red with slight traces of white. The piece has an oval base with a reserved underside and a red band on the outside at the bottom of the vessel. 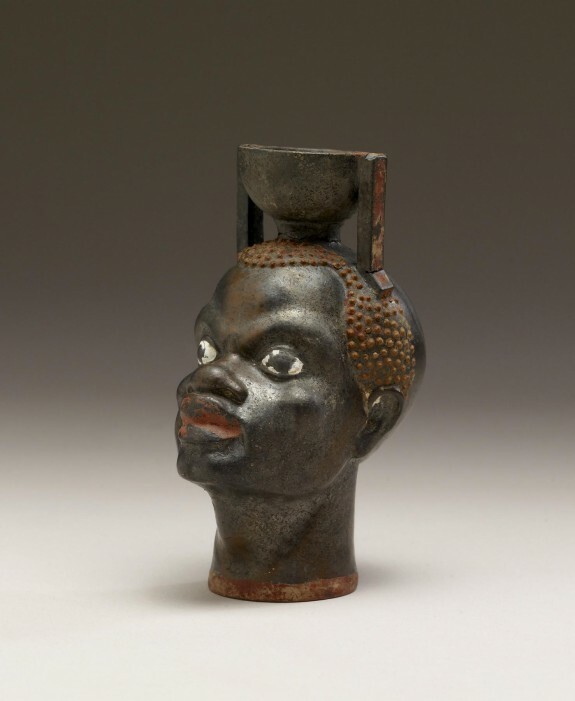 There is not another head vase known quite like this one. The date of the vase is difficult to determine for the form of the mouth and its supports are typical of examples from the late archaic, but the modeling of the face in respect to style is not far removed from the work of Sotades who was active around 460-450 BC. Revealing the African Presence in Renaissance Europe. The Walters Art Museum, Baltimore; Princeton University Art Museum, Princeton. 2012-2013. Provenance Joseph Brummer, New York [date and mode of acquisition unknown]; Joseph Brummer Sale, New York, 1949, Pt. III, no. 2; Walters Art Museum, 1949, by purchase.